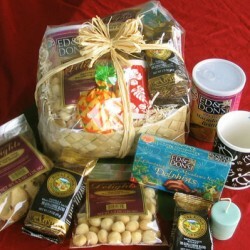 A medium-sized Hawaiian gift basket with 10% Kona coffee and locally made cookies with macadamia nuts and chocolate chips. Add a hand poured soy candle infused with tropical flower fragrance and dried mango with tangy li hing flavoring. 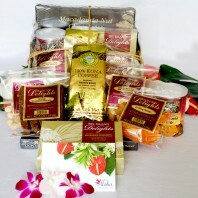 This is a gift basket selection for great price with a lot of variety at a lower price. All of the items are Hawaiian made. The Kona coffee blend is a pack that makes one full pot of coffee. We’ll choose from a variety of flavors. 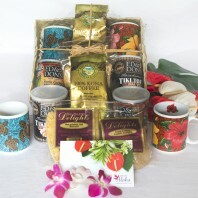 If you are giving to a true coffee connoisseur we recommend 100% Kona coffee. The cookies are baked by a family in Hilo. 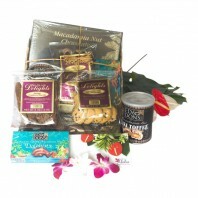 These Hawaiian cookies are made with local macadamia nuts and chocolate chips. The 4.5 ounce bag contains nine crisp cookies. Our candles are hand made and based in soy. Our candle maker adds natural essences that invoke the aromas of the islands. She actually makes these in her home in the Hawaiian rainforest near Kea’au. These are votive size candles and will burn 8-10 hours. The fragrance will bring the fragrances of the tropics to any room. Li hing mango is a contrast in tastes. The dried mango are delightfully chewy. The natural sweetness of mango is offset by the tart flavor of Chinese li hing. This is a tart spice made from plums. This has become a traditional Hawaiian treat. 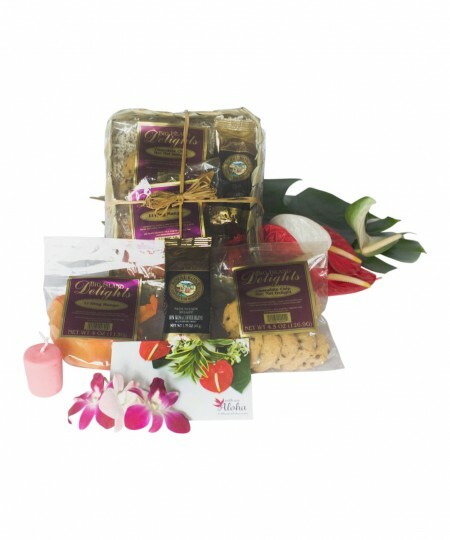 You can also create your own gift basket with all of your favorite treats. Just add them to a basket or gift bag. 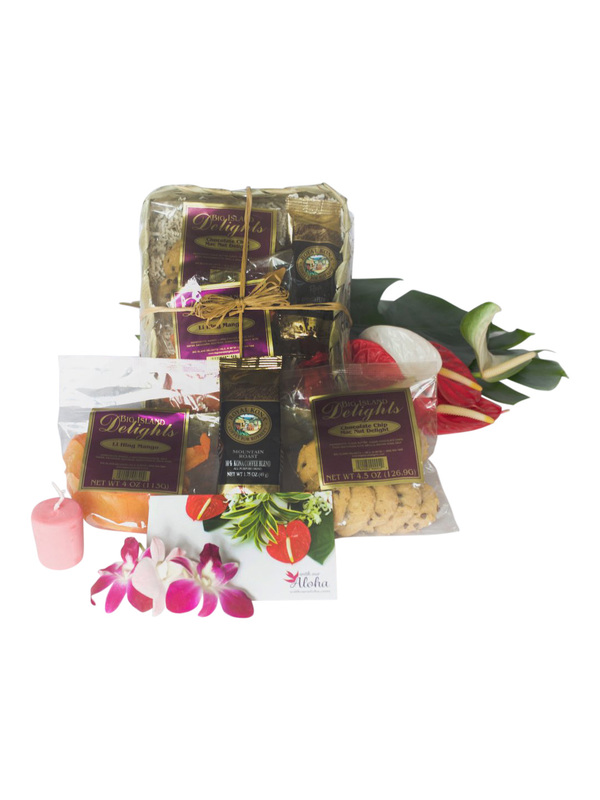 Arranged in a dried lauhala gift basket and tied with a natural raffia bow. Also available for Free Delivery to hotels in Waikiki.